After Vox Populi! 's "Half Dead Ganja Music" and Frank Dommert's "Kiefermusik", we have a hand picked compilation by the Hamburg artist Maat. 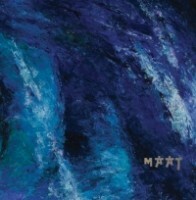 Maat is a solo project by Dorte Marth, who created two secretly powerful and underappreciated records in 1993. They were released on two labels (Dragnet, Dom Elchklang) run by Achim P. Li Khan, the co-founder of the Greatest Band On Eearth, H.N.A.S. Maat's musical pallette is at once, strikingly, a more dark and brooding occult version of Anima and Limpe Fuchs. One can hear classical music references much like Coil's Unnatural History, but played further, blurring the shadowy lines between sampling and virtuoso playing. Maat's dark and glisteningly illustrated use of electronic drums, Pan-Asian arrangements, and classical styles, invent a private world where she uncovers and projects forth, a new and ancient female energy. Its almost as if she is orchestrating her pallette and shooting it through star-clusters beneath the world. Probably Typhonian Highlife's and 4th World Magazines greatest influence.